Corporate inversion, sometimes called tax inversion, happens when a U.S. company sets up a tax home in a foreign country with lower taxes, to reduce its U.S. tax bill. In many cases, these companies keep their main operations in the U.S. These companies are usually multinational corporations with subsidiaries in other countries. Yes, corporate inversions can be considered tax loopholes, holes in the U.S. tax code that allow taxpayers (including businesses) to save money and that cut into tax revenue, draining money from the government. Taking advantage of tax loopholes is tax avoidance (legal), not tax evasion (illegal). Corporate inversions may not be illegal, but both President Obama and Congress have enacted regulations and legislation to attempt to curb these practices. Bloomberg reported that as of March 2107, "[M]ore than 50 U.S. companies have reincorporated in low-tax countries since 1982, including more than 20 since 2012." The most popular location for corporate inversions is Ireland, followed by Bermuda, England, Canada, and the Cayman Islands. The practice of corporate inversion began in 1982 and it peaked in 2014, when many very large corporations announced their intention to invert. Corporate inversions have traditionally had big tax advantages. The U.S. corporate income tax rate is the highest in the world at 35 percent, and having all corporate income, including income from foreign-based subsidiaries, taxed at that rate takes a big bite out of profits. U.S. companies are taxed based on the tax rate of their country of incorporation. But multinational companies headquartered in other countries pay U.S. taxes only on operations in the U.S.
For a big multinational corporation, locating the parent company outside the U.S. can mean millions of dollars in taxes that don't have to be paid. The Congressional Budget Office (CBO) estimates that between 1994 and 2004 multinational companies reduced their taxes an average of $45 million in the year after the inversion. 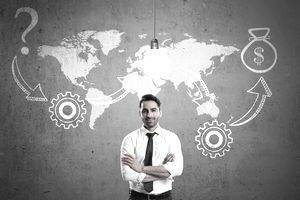 Locating overseas also gives companies a significant advantage over their competitors, because they can pocket more of their profits. Earnings stripping, shifting profits from the U.S. to other countries. This is typically done by having the U.S. affiliate pay interest on a loan of an affiliate of another country where the tax is lower. While the Obama Administration tightened restrictions on corporate inversions, the 2017 Tax Cuts and Jobs Act (TCJA) has tried to incentivize companies to stay in the U.S. in two ways: (1) by reducing the corporate tax rate from 35 percent to 21 percent, and (2) by following a territorial tax system. a U.S. company doing business in the UK first paid the British corporate tax of 19 percent. When the U.S. company paid those profits back to the U.S., those profits were subject to U.S. tax equal to the difference between the U.S. rate of 35 percent and the British rate of 19 percent. Most developed countries have a territorial system, in which profits of all affiliates or subsidiaries are taxed at their home base. Under this system, a company with headquarters in Canada and operations in England and Ireland would pay on the profits of each subsidiary depending on the tax rate of that subsidiary. This should make U.S. corporations less likely to move their headquarters from the U.S.​ since they will only have to pay U.S. tax on U.S. operations. But even under the new system and with new lower tax rates, some companies will still choose to relocate overseas. for example, Dana Inc., an Ohio-based company, is continuing with corporate inversion plans in spite of the new tax reform law. Many large companies have taken advantage of corporate inversion. For example, Bloomberg reports that 12 of the largest 20 companies incorporated in Ireland have roots in the U.S, including Allergan, an Irish biopharmaceutical company. In 2015, Pfizer, a U.S. biopharmaceutical company, considered a merger with Allergan to take advantage of the lower tax rate in Ireland. The deal was scrapped after the new Obama-era Treasury Department rules were in place. Another well-known company, Burger King, did a corporate inversion in 2014. They bought a Canadian company, Tim Horton's, and set up headquarters in Ontario, Canada. Walgreens also considered a corporate inversion in 2014 but decided to back out for a number of reasons. One reason was that the Walgreens brand is so well known in the U.S. that "customers could be turned off if the company they knew skipped town for tax reasons." While corporate inversions may continue, the new tax laws should help companies justify staying in the U.S., keeping more business tax dollars in this country.